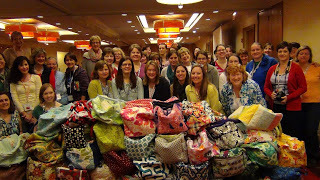 Sew South Retreat – The guest speaker was Leah Day! I’ve been following Leah Day from the sidelines for a couple of years. She is the FMQ (free motion quilting) queen and seems to have made it her mission to teach the rest of us how to do it too. She also appears to be out to prove that there is an unlimited number of designs to free motion quilt. She came up with 365 designs (a whole year’s worth!) and blogged about them complete with a video of her stitching them so you will know exactly how to do it. She now has a book with the designs in it so that you can see them easily all in one place. Leah also has other products in her online shop – all to teach and make free motion quilting as fun and easy as possible. Years ago I bought a reasonably priced table that she sells that allows me to sink my sewing machine down into it such that I can quilt with a flat surface surrounding the area where I’m actually stitching. So, as I said, I’ve been following her from the sidelines. I haven’t done a lot of free motion quilting but have wanted to do more and have looked at her different sites and watched some of her youtube videos from time to time. She looks as though she’s 12 years old. Apparently I’m not the only one who thinks so, because she says she is asked her age all the time. She is actually 29 years old and has a 6 year old son and a husband who now helps her with her business because she has gotten so busy. I sort of knew that she wasn’t running around all over the country teaching in person (by her choice). So, I was very pleased when it was announced that she would attend and speak at the Sew South Retreat. She lives in North Carolina and the retreat was close enough for her to easily drive there. She also teaches FMQ on Craftsy which is a video platform. I believe she has 2 classes and a 3rd which will be shortly released. If you sign up for one of her classes on Craftsy through her website, you will get a 50% discount. 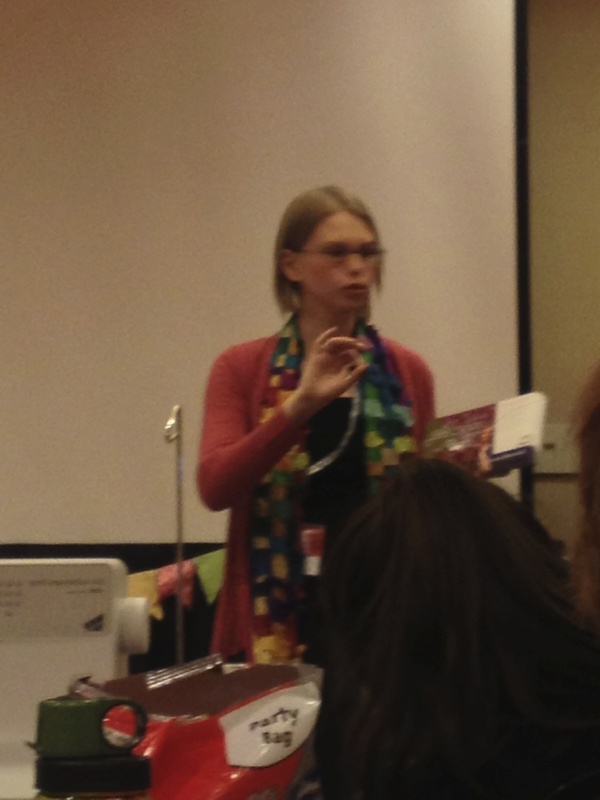 She spoke to us one evening about free motion quilting. Mostly she cheered us on and inspired us to give it a try, and wisely suggested we not pick our most heirloom quilt to start on. She also suggests that you quilt a little bit every day. If you do this, you will mentally and physically be better at it. I found out what a really kind, generous and passionate person she is. She was very open to discussing her business and all the struggles of getting there. She wanted to talk to the quilters who are trying to grow a business and tell them some things she has learned that she wished someone had told her sooner. She likes to support local businesses, is a fiber lover and raises chickens. She was a delight to meet in person and if you ever have a chance to meet her, don’t pass it up.